Product: Mashers Optipack 600ml Rectangular Disposable Plastic Food Containers with Lids, Pack of 5 was added to cart. 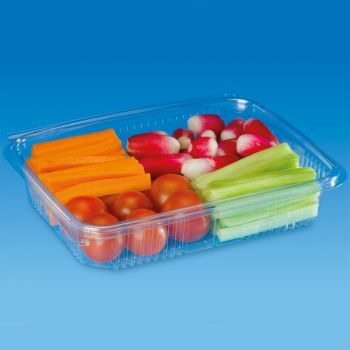 From Mashers Optipack Collection, these Rectangular Disposable Plastic Food Containers with Lids were made for take-aways, picnics, packed lunches, salad bars, and dessert buffets. Preferred by catering professionals and party planners for their compact styling and stackable design, these carry out containers are made from clear food-grade plastics, equipped with self-sealing lids, and they have a total capacity of 600ml. Ideal for outdoor entertaining, they can be stacked in the fridge to keep cold items chilled, and easily transported in cooler boxes, picnic baskets and backpacks.